Inch loss varies from person to person but one can expect to go down atleast by 2 dress sizes which has been documented. The procedure works as low level of visible diode laser lights which is painlessly absorbed by individual fat cell.the content is broken into fatty acid which escapes through cell wall and is easily burned down by body. The treatment is meant for body contouring with successful results for inch loss,cellulite improvement and skin tightening. Virtually a pain free treatment with visible results in 2 weeks .the treatment feels like hot stone massage.when combined with diet and exercise can reveal dramatic results for a slimmer you. Treatment is safe and painless and requires around 4 to 6 session at an interval of 10 days with each session lasting upto 90 mins . Ultrasound which helps in melting the fat in the targeted area and radiofrequency which helps tightening the skin which is lax.the procedure helps by stimulation of new collagen .the fat content of cells break down which gets excreted through lymphatics. Skin and you specialises in giving diet for weight loss which can gradually be made into a lifestyle change so as to help you maintain the weight loss achieved . What do you will feel during the treatments – A comfortable, relaxing treatment with a typical sensation of warmth. 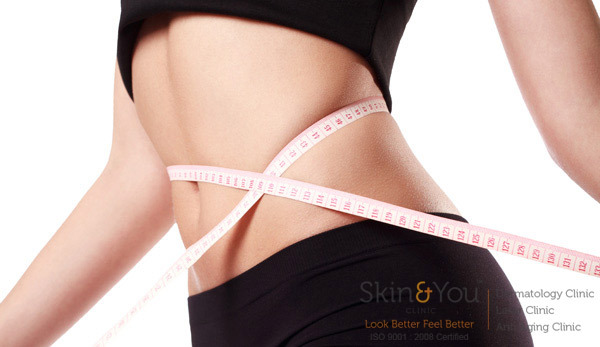 Why Skin & You Clinic for Body Slimming Treatments? We at Skin & You Clinic understand your concerns all plans are custom made as per indivivual needs and concerns,we help you formulate and ideal routine to achieve your desired goals.